June 30, 2016 by Nils Oudhuis . Tags " anamnesis, communication, Health literacy, history taking, ICF, interview, listening, low back pain, physical therapy, physiotherapy " . Tailoring health information and health literacy. Bob Vermeeren-de Groot, a dutch physio- and manual therapist, Msc. His expertise domain is pain in general and he predominantly treats people with spine, shoulder and hip pain. He works in a small community and this is a reason why he became interested in public health. Patient-provider partnership he finds very important and optimilizing the balance between targeted and tailored physiotherapy. Health is an important value in our contemporary western culture. Machteld Huber et al. define health as an ability to adapt and self-manage, . She defines different operationalised roles in health that seem to parallel the ICF-framework, such as bodily functions, mental function & perception, daily functioning and social participation. Other roles can be seen as a broader operationalization of health, such as quality of life and existential dimensions. As we define health as the ability to adapt and self-manage, access to accurate and reliable health information is a great opportunity for health care. Nowadays most people have access to many sources of health information. However, to use health information to our benefit, we need to understand and self-tailor the information available to us. 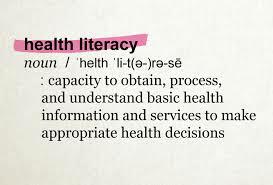 The ability to access, understand and use health related information to our benefit is called health literacy. In the EU health literacy is problematic in 29% – 62% within the general population. The proportion of people with insufficient health literacy is probably greater within the population that are visiting physical therapists (PTs), . So if we provide health information, we should deliver tailored health information. It is about tailoring information to the patient. To me there are some key elements that I’d like to put into any consultation. I’ll try and examplify it with the case of nonspecific low back pain. You take some, you give some. 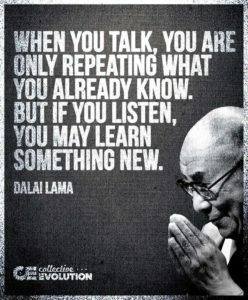 It all starts with listening. Patient narratives reveal information about expectations, illness perceptions, coping and the impact it has on daily living and social life–. If something interesting pops up, encourage the patient to elaborate, for example by asking: “So you say you gave up running as a hobby, but I’m interested to hear what happened with your back pain, before you gave it up”. By listening to the narrative, you’ll get clues to effective metaphores, type of language to use and gives you some patient experience to use as examples, –. Although uncertainty is often percieved as a threat, understanding it helps making tailored decisions–. Because many measures are relative, such as odd ratios, relative risks, specificity / sensitivity, and likelihood ratios it is difficult to put these in clinical context–. Absolute numbers, are easier to understand , . 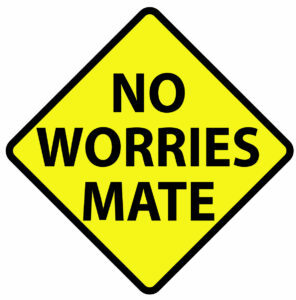 However clarity is more important than certainty. Your own clinical experience and clinical data is your friend to rely on here. When you communicate uncertainty, it is important to be able to explain it in many ways, . In general, patients overestimate benefits and underestimate harms of treatment. Start with the obvious part before going on to the interesting part. It seems trivial but a statement like: “You contacted me because of back pain is keeping you from running” can actually be comforting. Next is the lesser obvious information for the patient, for example: “I’ll classify it as the most common (and benign) back pain. There are no reasons to assume it can be contributed to a specific disease or anatomical structure. Your back pain has more to do with the mechanisms of pain experience and how we react to pain.” Encourage the patient to respond to this. This allows the patient to find the interesting part. When the patient responds from a patho-anatomical point of view, the key message is that there is not a single cause and looking for it with imaging does more harm than good. 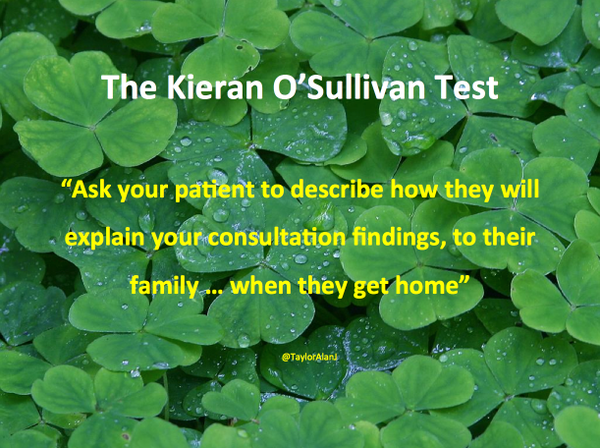 You can start explaining the interesting part by mentioning the patients narrative. For example: “You told me during running pain increases and afterwards, it is hard to get up from the chair. These symptoms come to show in some of the tests for the way you move with pain and fatigue. You told me you gave up running, because you were trying to prevent pain. It is quite common to become less active and more cautious when we’ve experienced pain. Unfortunately, we then become more sensitive to pain and fatigue comes sooner”. Now it is time for the patient to take over. Encouraging the patient to ask questions and thinking out loud prevents unnecessary overcomplicated information to overload the patient. It also provides the opportunity to check whether information is understood. Research showed plants reduce stress, I ate three but I’m still distressed. We have now started our tailored educational intervention. Key, however, is to let the information benefit the patient. Your patient hopefully has taken the message that low back pain is common and benign, and that it is important to stay active. If necessary, exercises can be added, but it is worth asking the patient whether there are activities they can start again after the consultation. Perhaps the patient is willing to start a short interval training. 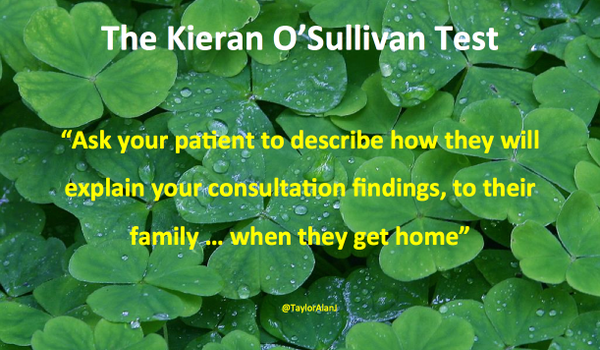 At the end of a consult, the information is summarized, preferably by the patient. If possible I tend to ask how they are going to explain their backpain or (treatment) plan to others. While working with patients to make a change, I might ask what they will do (differently) next time I will meet them, to make sure the information can be used to their benefit. In the next encounter I’ll ask the patient what they remember best about previous consult and if there are any questions about that. 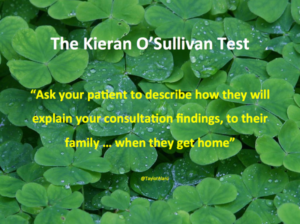 If the patient confirms they remember the key messages, I think it is great to get an honest answer when I ask: “Did it help/affect you last week?”. Again this opens the next door to tailored communication and gives me a clue whether the information was useful. So here we are at the end of this, not-so-tailored, information. It would be great to read some comments down here, that summarizes this blog, along with all kinds of questions and ideas on the subject! M. Huber, J. A. Knottnerus, L. Green, H. van der Horst, A. R. Jadad, D. Kromhout, B. Leonard, K. Lorig, M. I. Loureiro, J. W. M. van der Meer, P. Schnabel, R. Smith, C. van Weel, and H. Smid, “How should we define health?,” BMJ, vol. 343, p. d4163, 2011. The Lancet, “What is health? The ability to adapt,” Lancet, vol. 373, no. 9666, p. 781, 2009. M. Huber, M. Van Vliet, M. Giezenberg, B. Winkens, Y. Heerkens, P. C. Dagnelie, and J. A. Knottnerus, “Towards a ‘ patient-centred ’ operationalisation of the new dynamic concept of health : a mixed methods study,” pp. 1–12, 2016. K. Sørensen, J. M. Pelikan, F. Röthlin, K. Ganahl, Z. Slonska, G. Doyle, J. Fullam, B. Kondilis, D. Agrafiotis, E. Uiters, M. Falcon, M. Mensing, K. Tchamov, S. Van Den Broucke, and Helmut Brand, “Health literacy in Europe: Comparative results of the European health literacy survey (HLS-EU),” Eur. J. Public Health, vol. 25, no. 6, pp. 1053–1058, 2015. J. Vandenbosch, S. Van den Broucke, S. Vancorenland, H. Avalosse, R. Verniest, and M. Callens, “Health literacy and the use of healthcare services in Belgium,” J. Epidemiol. Community Health, no. April, pp. jech–2015–206910, 2016. K. Friis, M. Lasgaard, R. H. Osborne, and H. T. Maindal, “Gaps in understanding health and engagement with healthcare providers across common long-term conditions: a population survey of health literacy in 29 473 Danish citizens,” BMJ Open, vol. 6, no. 1, p. e009627, 2016. R. M. Epstein, B. S. Alper, and T. E. Quill, “Communicating evidence for participatory decision making.,” JAMA, vol. 291, no. 19, pp. 2359–2366, 2004. M. Bury, “Illness narratives: fact or fiction?,” Sociol. Health Illn., vol. 23, no. 3, pp. 263–285, 2001. C. R. Green, “Being present: The role of narrative medicine in reducing the unequal burden of pain,” Pain, vol. 152, no. 5, pp. 965–966, 2011. A. W. Frank, “From sick role to practices of health and illness,” Med. Educ., vol. 47, no. 1, pp. 18–25, 2013. K. L. Barker, M. Reid, and C. J. Minns Lowe, “Divided by a lack of common language? A qualitative study exploring the use of language by health professionals treating back pain.,” BMC Musculoskelet. Disord., vol. 10, p. 123, 2009. S. Neilson, “Pain as metaphor: metaphor and medicine,” Med. Humanit., pp. medhum–2015–010672, 2015. M. Stewart, “The Hidden Influence of Metaphor Within Rehabilitation.pdf,” In Touch, no. 153, 2015. D. Serbic, T. Pincus, C. Fife-Schaw, and H. Dawson, “Diagnostic uncertainty, guilt, mood, and disability in back pain.,” Heal. Psychol., vol. 35, no. 1, pp. 50–59, 2016. E. Engebretsen, K. Heggen, S. Wieringa, and T. Greenhalgh, “Uncertainty and objectivity in clinical decision making: a clinical case in emergency medicine.,” Med. Health Care. Philos., 2016. J. T. Operskalski and A. K. Barbey, “Risk literacy in medical decision-making How can we better represent the statistical structure of risk? By,” Science (80-. )., vol. 53, no. 9, pp. 1689–1699, 2013. M. Davidson, “The interpretation of diagnostic test: a primer for physiotherapists.,” Aust. J. Physiother., vol. 48, no. 3, pp. 227–232, 2002. W. H. Replogle and W. D. Johnson, “Interpretation of absolute measures of disease risk in comparative research,” Fam. Med., vol. 39, no. 6, pp. 432–435, 2007. R. Lehman, A. M. Tejani, J. McCormack, T. Perry, and J. S. Yudkin, “Ten Commandments for patient-centred treatment,” no. October, pp. 532–533, 2015. A. Pleasant, M. Rooney, C. O. Leary, L. Myers, and R. Rudd, “Strategies to Enhance Numeracy Skills,” 2016. T. C. Hoffmann and C. Del Mar, “Patients’ Expectations of the Benefits and Harms of Treatments, Screening, and Tests,” JAMA Intern. Med., vol. 175, no. 2, p. 274, 2015. S. M. Rubinstein and M. van Tulder, “A best-evidence review of diagnostic procedures for neck and low-back pain,” Best Pract. Res. Clin. Rheumatol., vol. 22, no. 3, pp. 471–482, 2008.